Interview: From doubting she had won the part, the actor has brought the Bard’s embattled queen to a fine pitch at Chicago Shakespeare Theater. Through June 16. 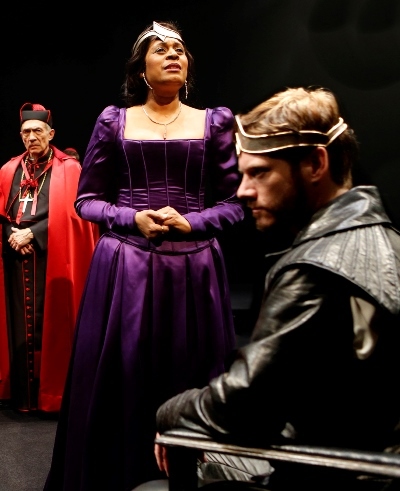 Ora Jones, so assured and imposing as Queen Katherine in “Henry VIII” at Chicago Shakespeare Theater, was just as confident she had blown her audition for the part. And that wasn’t such a bad thing, she thought – because Katherine’s great speech in her trial scene, the very audition piece that Jones would come to deliver with authentic majesty, had left the actor essentially mystified. What’s so hard about Shakespeare’s trial monologue, says Jones, is rooted in the queen’s puzzlement over the third degree she’s getting in this public venue, and why her husband and mutually respectful partner of 20 years, Henry VIII, will scarcely acknowledge that she’s in the room, much less speak to her. The king (Gregory Wooddell) has resolved that Katherine must be deposed as queen — divorced — so that he can remarry in hope of producing a male heir to the throne. He is abetted in this by Cardinal Wolsey (played by Scott Jaeck), who is seconded by an emissary from the pope, Cardinal Campeius (David Darlow). Katherine, astonished and humiliated by such treatment, wishes access to a lawyer from her native Spain, but is refused. The same cats now licking their chops, Wolsey and Campeius, will counsel this canary. But how to play it – demure, diffident, desperate? “I could not be the dainty queen here,” says Jones, an Ohio native and Notre Dame graduate who has been working in Chicago theater since the 1980s. “The king wants a divorce, but for Katherine that is unthinkable. And besides, she loves him. She also feels entitled to speak for herself – and to remain in control. In rehearsal, Barbara Gaines (the director) was adamant about the fact that this was a public event, and to break down, to allow yourself to be destroyed in public, would be unacceptable for a monarch. “But Henry has found another woman (Anne Boleyn) and he means to make her queen. He must get this formidable woman out of the way. The trial becomes a battle and she means to win it to keep her marriage together. She’s upset and angry, and she believes she’s in the right. You can’t move her off that. Jones calls that defining scene a delicate balance for Katherine, between preserving her personal dignity and pushing back against the will of the king. “As an American and a private citizen, I can’t imagine having to present myself under those circumstances,” she says. “So that wasn’t a way in for me. What worked was that Katherine loves this man. I know what love is. We know what it means to have love and to lose it, or to fight against rumors with everything you’ve got. To fight against machinations and all kinds of crap. Though the queen wins that round, the game is far from over. Wolsey and Campeius pay a visit to Katherine in her chambers, where they answer her further rebuffs by applying pressure of the physical sort. This actor who feared she might have grabbed a tiger by the tail in taking on the role of Katherine has, through long rehearsal and many performances, melded into the queen’s skin. Jones says she never really knows from one night to the next where the play will take her. “Writers often talk about how the plot takes over from them. As an actor, you sometimes find a character getting away from you. For me, Katherine’s objectives change from day to day. There are days when she wants to be heard in ways I hadn’t quite expected. Much of that has to do with the audience. In a thrust theater, you’re looking right at them. You feel their vibe, and you react to that. One other thing was on Jones’ mind, another enveloping issue — that glorious purple gown Katherine wears. “The purple dress isn’t heavy, but it is a lot of fabric,” she says. “In one performance I got my heel caught in it and nearly fell. There are times when it feels like the costume’s wearing you.